Headlamp Design with Blade attachment used on many helmets. One of the best things about the Stenlight is how small it is. 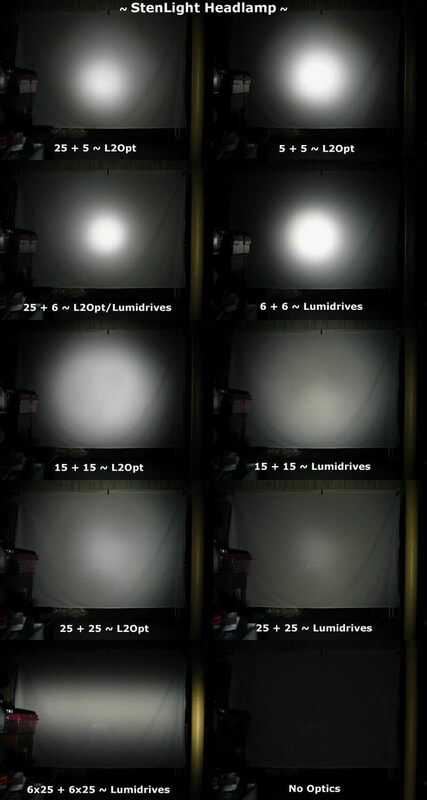 The light itself is about the size of a film canister, or alittle smaller than a D size battery. This makes it very easy to use for one of its main purposes, caving. and the small size keeps you from bumping it into cave walls. with a stainless steel front face place to hold the lens in place. The blade attachment, hinge, and switch are also all stainless steel. 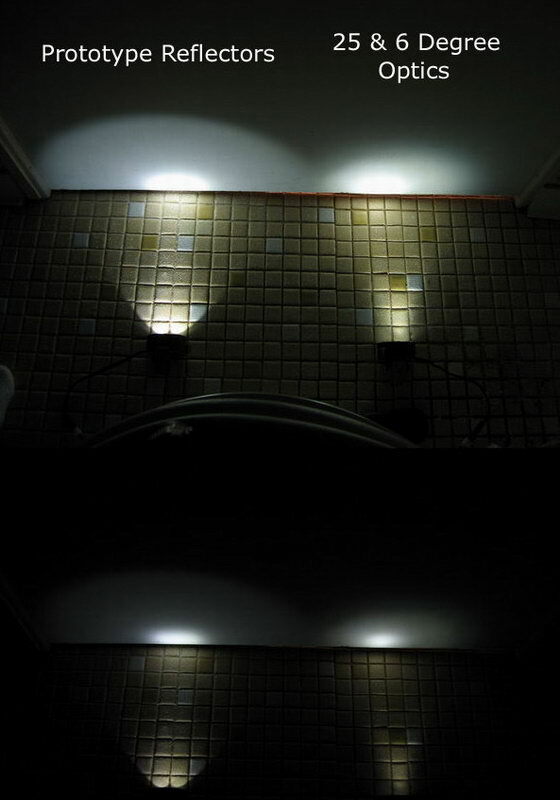 The dual 3 Watt LEDs can produce up to 140 lumens of light. That is a very impressive amount of light output for a light of this size. and flat out kills most of them. Only HID systems can out perform it. The light met everyone of my expectations, and exceeded many of them. Design and build quality were excellent, its size and input voltage range makes it very versatile. As stated above, the Stenlight is smaller than a D cell battery. With the blade attachment and hinge protruding out the back about 7/8"
The Stenlight weighs under 125 grams, minus battery pack. This is important for a headlamp, you dont notice the weight much at all. The 2 cell Lithium Ion battery pack balances it well, when mounted on the rear of the helmet. The Stenlight is a very well made light. All the materials used are high grade and suit its needs well. The body of the light is aluminum, all other external parts are stainless steel. Some of the stainless steel parts had some machining marks, from being stamped and bent. and nothing that could cut you while handling it. Overall, everything on the Stenlight is meant to be very rugged, and survive very extreme conditions. The testing I have done so far, shows the Stenlight to be very regulated. Maintaining a rock solid, very flat output for its entire runtime. There is no dimming over time. This can be seen in the runtime test below, using the "High" setting. These 4 Brightness Levels are controlled with a magnetic Hall Effect Switch. and changes the brightness level accordingly. No part of the switch actually penetrates the inside of the Stenlights body. The result is that the switch does not effect the lights water resistance what so ever. This also makes the switch very reliable, because there are no internal moving parts. 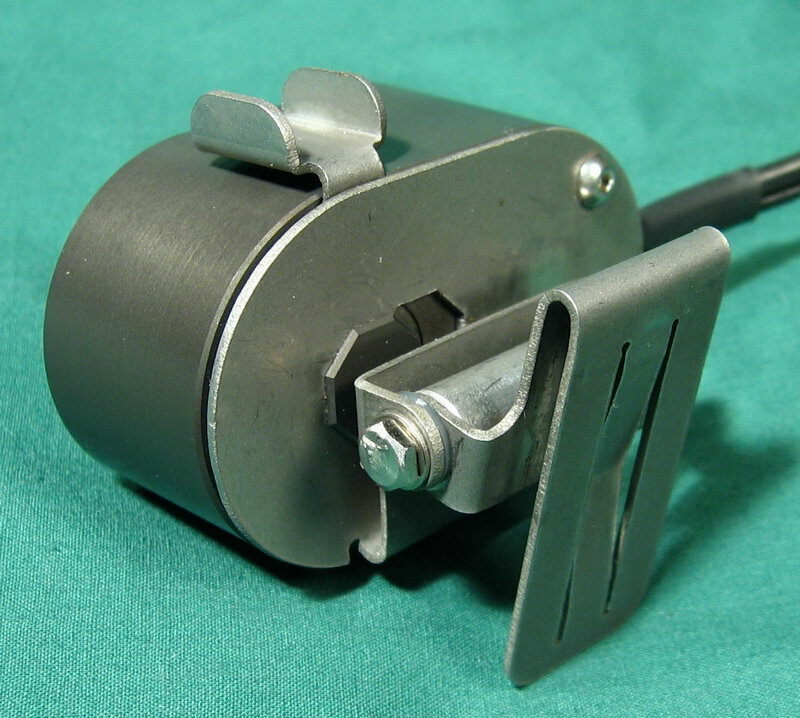 The only moving part of the switch is its actual rotation, which is assisted by a ball bearing. The stainless steel switch, connected to the back of the light, rotates a full 180 degrees. Making is very easy to operate with thick muddy gloves on. This also makes it very easy to reach up, and feel what setting you are on. that prevents both the LEDs from running too hot, and to keep the body of the light cool enough not to burn you. In most conditions, the Stenlight will only thermal limit itself when used on the Turbo setting for long periods of time. the Turbos output by about half. Or, about 140 lumens, to about 70 lumens when thermal limited. The Stenlight comes with one 15 degree, and one 5 degree optic installed. There are a variety of different optics out there, but be aware that not all of them will fit properly. The supplied optics are by L2Optics. Most all of those should fit, except the rectangle beam pattern type. I replaced the 15 degree L2Optics optic in mine, with a 25 degree optic from Carlco. so that they sat high enough in the optic holder to engage the front lens, which is what holds the optics in place. 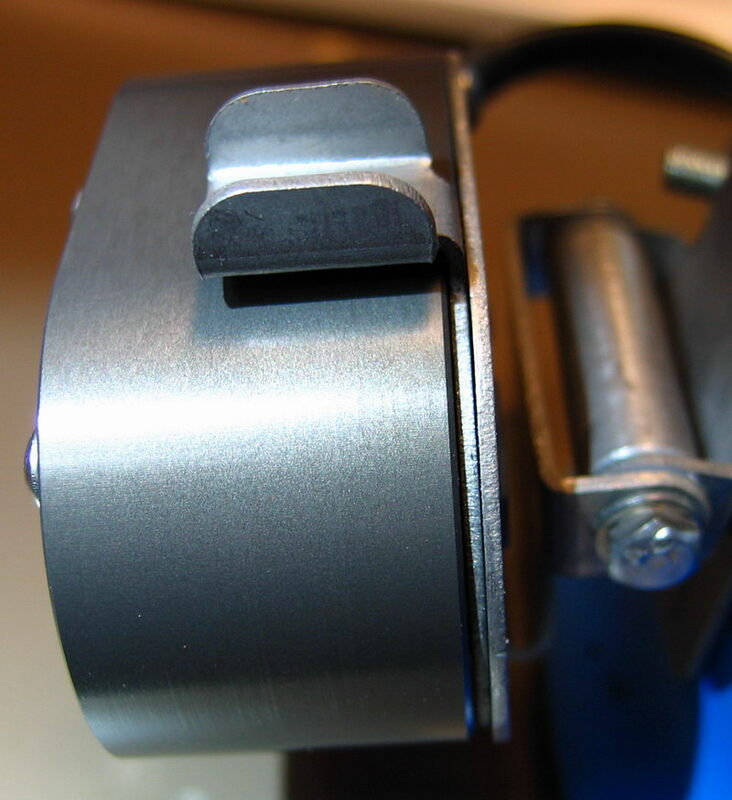 Also, make sure the the optics you use are not too tall, this can cause the lens to crack when tightening. I also tried using IMS 17mm Reflectors, they are a couple mm too tall, and will not work with the Stenlight. 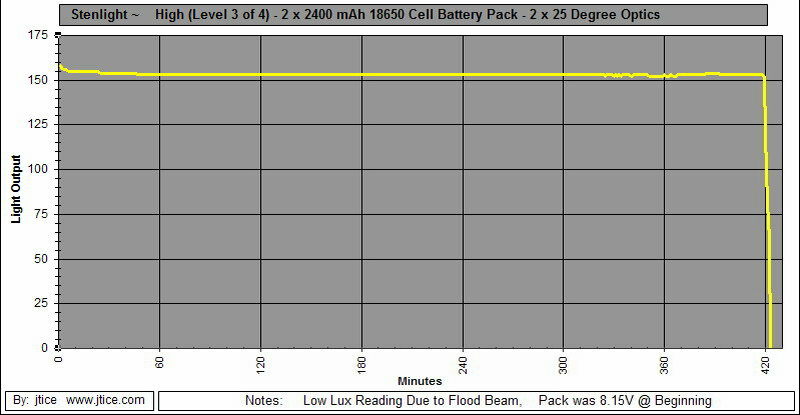 For now, the stock battery pack for the Stenlight is a 2 cell 7.2V Lithium Ion 2300 mAh Pack. Which will get you about 7 hours of runtime on High. That is a very respectable runtime, considering its output is bright and completely flat regulated. The wide voltage range makes it very versatile for many situations. You can make your own battery packs to fit many needs. I have a photo below that I made using different combinations of optic. The beam pattern will vary greatly, depending on the optics used. I found the stock beam with 15 and 5 degree optics alittle too narrow. I personally like a wide flood for headlamps, thats why I swapped the 15 degree optic to a 25 degree one. Below is a runtime I made, using a battery pack I made. The pack is essentially the same as the stock Stenlight pack. the pack to a slightly higher voltage. This would explain my runtime of slightly under the rated 7 hours. As you can see, the runtime is VERY flat, due the the circuits regulation. This means that you get the full potential of the battery's power. you end up wasting battery power that is left in the cells. The Stenlight has complete thermal protection built in. the current to the LEDs is then limited, letting the light cool down. Under most circumstances, thermal limiting only occurs on the Turbo level. and can be touched with bare skin. There is not alot of mass to dissipate the heat, due to the lights small size. But the body of the Stenlight is rather thick, and there is alot of aluminum there for its size. I see No problem with leaving this light on, unattended, on any setting. The Stenlight is simply the best headlamp/caving light that I have ever came in contact with. I love the size and shape of the light, you can hardly tell its on your helmet. brightness level you are on, by simply reaching up and felling where the switch is. There is 1/2" travel between each level. After about a 4 hour day of caving, I noticed that I had gotten a large amount of dirt and mud in the switch. I was a bit concerned at first, due to the switch having a very gritty feeling, as I rotated it. Fortunately, the light never failed to work, and all levels were working just fine. This was easily fixed my submerging the light in water, and rotating the switch back and forth a few times. The Blade attachment method is used mainly for helmets, and has been used by cavers for a long time. But it may not be very useful to some users that dont use helmets. There are plans however for regular headlamp straps, and bicycle mounts. The Prolite headstrap is said to work though, and I have one on order to try. The Prolite strap item 17-2402, along with the Stenlight, can be purchased at Inner Mountain Outfitters. The Stenlight is a bit pricey, especially after buying a battery and charger. But I have found the old saying is always true, You get what you Pay for. I am confidant that the Stenlight will provide me with many years of trouble free operation. I had the pleasure of testing the prototype reflectors, made for the Stenlight S7. Jon started work on the reflectors with another very talented CPF member. Their goal was to replace the stock optics used in the Stenlight, with custom made metal reflectors, achieving a much more usable beam pattern. Optics tend to cast uneven beams with artifacts. 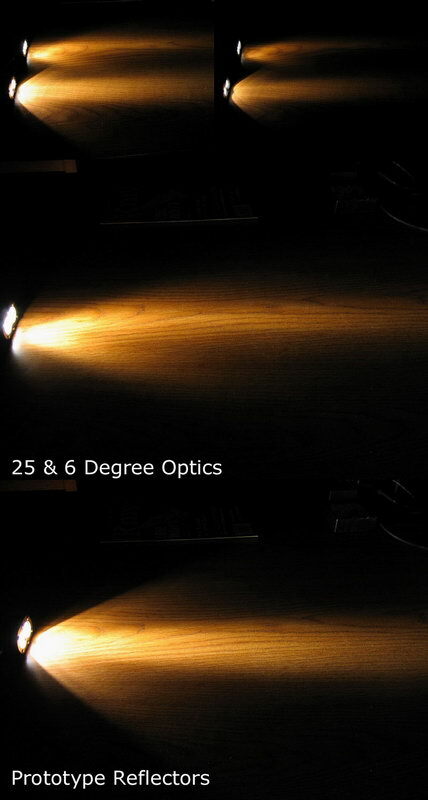 The efficiency of optics is typically not as good as reflectors either. I have tried quite a few combinations of optics, as you can see above, but I never really got the perfect beam. The right combination of smooth, wide flood light, and a good sized hotspot that threw well. The Prototype reflectors did a fantastic job of both. The flood was much wider, which is very important in a headlamp. You need to be able to have good peripheral vision, and the ability to see down at your feet, without swinging your head around to cast the light where you want it. There were no artifacts in the flood light with the reflectors, which was also a big improvement. Artifacts in the beam can be distracting. The hotspot was also more even and smooth. The reflectors threw very well, especially for having so much flood also. The hotspot was fairly tight, but faded out to the flood well. So it was not a distracting spot in front of you. This was a problem I had with the optics. If I used a combination that threw well, I would loose too much flood, and the spot was uneven and somewhat distracting. The greater efficiency of the reflectors means that you are making better use of all the lumens of light the LEDs are emitting. This allows you to achieve a beam that has both good flood and spill. Since reflectors cast a much smoother beam with no artifacts, the light is very easy on the eyes and less distracting. I was very pleased with these prototype reflectors. They were a vast improvement over the optics in very way. My only suggestion to Jon, was to make the hotspot slightly larger. Some might find a tight hotspot too distracting for close-up work. 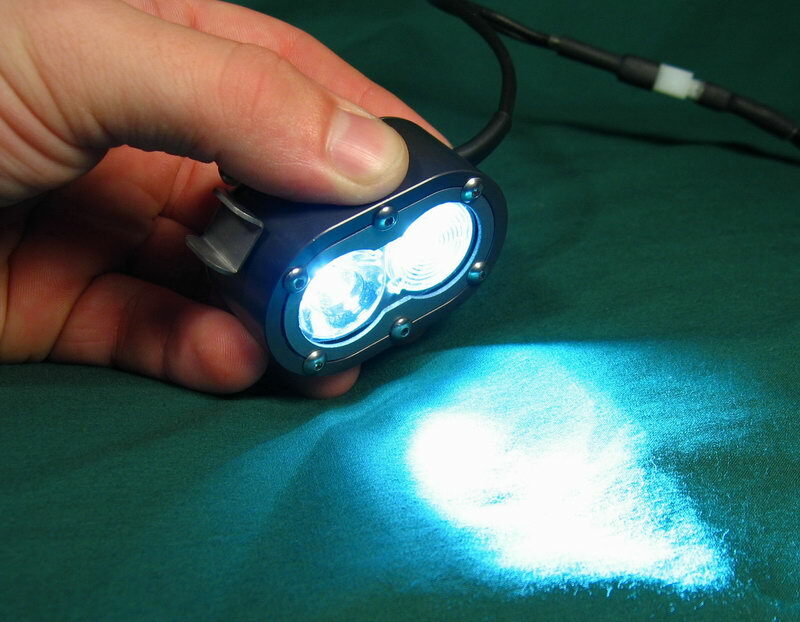 The Stenlight was primarily developed as a caving light. Where you can spend alot of your time in small passages and crawlways. The wider hotpot would look better in these close situations. The production version of reflectors are supposed to have a slightly larger hotspot, so these should prove to me an excellent improvement to the already outstanding performance of the Stenlight. 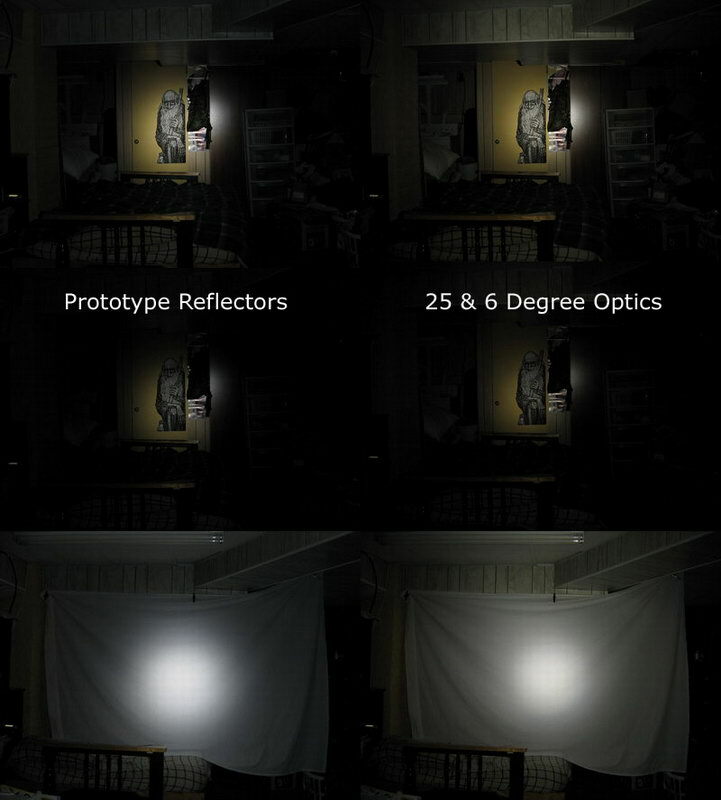 Jon will be selling the reflectors separately, as well as offering Stenlights with them pre-installed, at great prices!